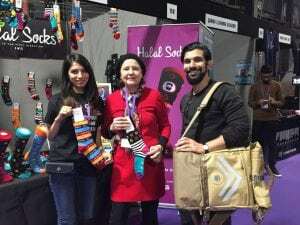 A record-breaking number of visitors have taken part in one of the world’s largest showcases of the Muslim consumer market. Over 13,000 people from across the UK attended the third annual Muslim Lifestyle Expo 2017 (MLE2017), which took place at EventCity in Manchester. The show featured 150 international and UK exhibitors. The Muslim lifestyle sector has seen growth at nearly double the rate of the global economy with expenditure of consumers on food and lifestyle sectors growing by 9.5% to $1.9 trillion in 2015 and projected to reach $3 trillion by 2021. A number of household names featured in the event including Tesla, RAF, British Army, Lexus, Toyota, The Body Shop, Rubicon, Qatar Airways, Haute Elan and Manchester Art Gallery. Salama Evans, Managing Editor, HalalFocus with Halal Socks and Fajgear. Tahir Mirza, founder and CEO of MLE2017, said: “We are pleased that once again the MLE team has delivered a professional, high quality and international standard event. “Our vision has always been to create a commercial platform that benefits the growing Muslim lifestyle sectors and captures the talent and innovative capabilities of the British Muslim population. “MLE connects the public with mainstream non-Muslim economies and serves to highlight the immense contribution the Muslim community makes to the global economy. “Given the high standards we set each year, and the very positive feedback from visitors and participating businesses alike, this now is a firm fixture in the calendar. “We are particularly pleased to see the high number of Muslim businesswomen in start-up companies, as well as accounting for nearly 60% of the visitor demographic. “We would like to extend our thanks to all those who attended from across the UK and abroad and those who exhibited and partnered with us in playing a key part in making this year’s event so successful. MLE has been created to provide a unique marketing platform for global brands and businesses to engage with the Muslim consumer. This year’s event, with Asda as headline sponsor, featured live fashion shows, cookery shows, seminars from leading speakers and dedicated kids and sports zones.